I don’t know when could be pinpointed the exact time I turned on the road less traveled. Maybe it was when I turned 25: recovering from a back surgery and realized 1) health was fragile and 2) life was short. Therefore, anything really important to do should be attempted sooner than later. This led to an introspection of priorities which resulted in sweeping changes. Most recently, the road less traveled has led me to spend several days in Venezuela, visiting a friend named Natalie. I met here in Haiti back in March, she works at an International High School in Caracas. Anyhow, I’m now back at the Heartline guesthouse for a day after a great trip – and thought that before returning to my village up North tomorrow I should write a blog post (while I have a nice computer to do it on). My travels began last Wednesday with a motorcycle ride from Ravine Seche to Port-au Prince. Here’s a picture taken just outside “my” village. This is about the spot on the road I catch internet best. So if I do a Skype call, it’s from close to here. Nothing goes smoothly in life, and the motorcycle ride was a good example of that (as are guy-girl relationships in my life in general). My bike died before reaching Port-au Prince due to an ignition problem. Friends came to my rescue with a pickup truck. Thanks, TJ! Enroute to Venezuela I had a one day layover at the Caribbean island of Curacaos. Since my layover was from one evening to the next, I rented a car and played tourist. The vehicle I got was the most anemic non-masculine specimen I’ve ever had the pleasure of sitting behind the wheel of. At least it was stick shift. Curacao is only about 25 miles long and I drove around it, twice. There’s a tourist strip in Wilemstead where cruise ships land. I’d never seen a cruise ship before up close and was surprised at their impressively gargantuan size. I walked around the shops but didn’t buy anything because there was nothing I wanted. It never ceases to amaze me how many people will be milling around the touristy shop sections of a town in comparison to how few people are frequenting the really cool spots. Like this park on the North coast that had tremendous waves crashing into a cliff, shooting spray probably 30’ in the air at this scenic overlook. At that amazing place, I was the only one around. Curacao is administered by the Netherlands. Therefore, Dutch is a spoken language. Anyone that looked Caucasian like me was speaking garbly-goop. But mainly I heard Spanish. Never seen so many casinos on one island before. Then again, I’ve not been to many islands. Ended up spending the night in my car at a fishing beach up North. Though not overly comfortable, it was budget accommodations. And a little ways up the road I found an observation point where I watched fisherman bring in their morning catch. Local women came down to buy selections of fresh fish right off the beach. I walked down and took this picture of the fish. They were small and looked more like bait fish than edible. The men treated me curtly, even when I tried speaking with them cordially. There wasn’t too much exciting to do at Curacao that I could find. Some of the beaches were top-notch, but vacationing to a Caribbean beach when you already live at a Caribbean beach makes the beach not seem as amazing. Geographically, Curacao is fairly flat, the highest point being about 1,000 feet. Vegetation was scraggly, a real suprise… I didn’t see banana, mango, or avocado trees, for instance. Another bad habit from Haiti was that I found myself getting annoyed by red lights and tempted to go through them whenever the intersection was clear. And lines on the road felt claustrophobic. Having to stay in them felt restrictive. I couldn’t figure out if the U-Turn sign with a red band around it meant it was OK to do U-Turns, or wasn’t OK to do U-Turns? Driving in a foreign country poses certain challenges… I did the U-Turns and no one stopped me – so I guess the sign was saying it was OK. The only exotic food I ate on the island, besides Burger King, was a can of coconut water, if that can be counted food. It was delicious. In case you haven’t heard, the country of Venezuela is out of toilet paper. Or mostly out. Fortunately, some enterprising person made a Smartphone App that tells which stores have TP in stock. Whenever a new shipment arrives, people fight over it, or so I heard. Also fortunately, where I was staying still had half a roll left, which was to be used judiciously. I found interesting that by each checkout in the grocery stores is a piece of paper that tells which items are currently rationed. Rationed? Really, in 2013? Butter is rationed, for instance. And butter is even kept locked in little boxes to prevent theft. The benefits of communism at work. And in case you’re wondering, this exchange rate doesn’t work in reverse for Venezuelan’s (would be great for them if it did). Au contraire, US dollars are essentially outlawed in Venezuela. It is very difficult for a Venezuelan to obtain them, other than by trading for them illegally on what’s called the parallel market. The upshot is that Bolívar’s are essentially “funny money” only good in Venezuela, practically worthless everywhere else. From my perspective it is another form of control and oppression by the government. And it doesn’t help the Bolívar is experiencing a 35% inflation rate just now. Isn’t that all a bizarre and a complete mess? I thought so too. Caracas is a long, wide city in a valley. I found the main portions fairly modern. It was enjoyable to take runs through the city, especially since the weather was cool and cloudy while I was there. Ryan asked me what the most interesting thing I saw in Venezuela was (besides Natalie) and I told him the barrios, or slums. They build houses super close together on these hills where it almost looks like dwellings are sitting atop each other. 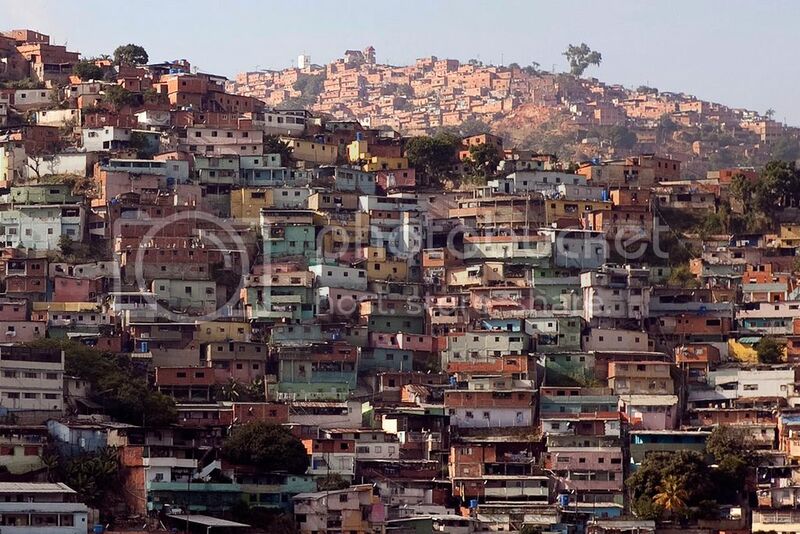 Unlike the picture below (pulled from the web), the barrios I saw had satellite dishes sticking out everywhere. 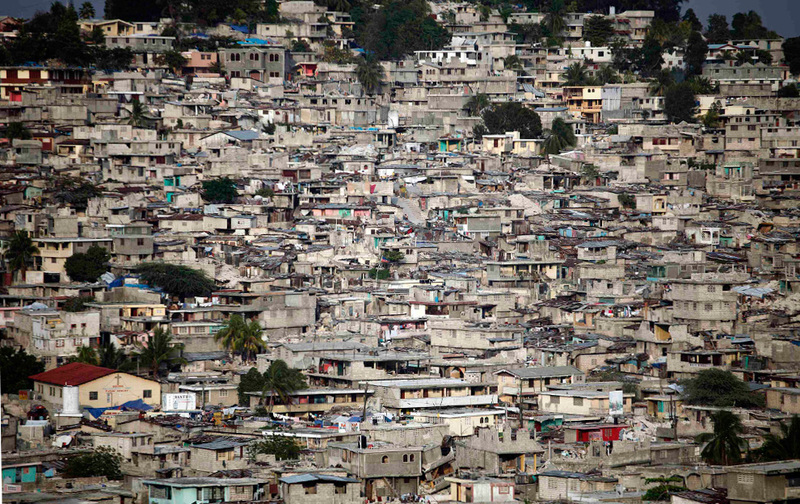 Though there are similar-looking places in Port-au Prince (see this picture), they are not near as extensive, nor anywhere near as dangerous to visit. I was warned about safety issues in Caracas. Apparently, if you stay there long enough the chances are you’ll get held up. Not necessarily shot and killed, but robbed. Most people I met had been robbed at one time or another. Fortunately, I had no mishaps with thuggish ne’er-do-wells. The only danger I felt was from traffic, but drivers were fairly considerate of pedestrians overall. Though one motorcyclist almost hit me. 3) Weather. Since Caracas is closer to the equator I assumed it would be hotter than Hades (I mean, Haiti). But at 3,000’ elevation it was, least while I was there, a refreshingly cool change from Port-au Prince muggery at sea-level. 4) Infrastructure. Many buildings were more modern-looking than I was expecting. 5) Lack of people greeting each other in public places. This may be a “big city” phenomena more than a Venezuelan one though. Having come straight to Venezuela from Haiti, the entire time I felt culturally off-balance. *Roads and buildings reminded me of America, but not quite (more concrete, very little air conditioning, not good sidewalks, couldn’t flush toilet paper, couldn’t drink tap-water, power outages, for examples). *Cars, instead of trucks and SUV’s. *All the people Hispanic, which was really weird to me. At the same time, many Venezuelan’s were neutral enough in features to almost pass as Caucasian, but not quite. Often I’d catch myself thinking, “Oh, maybe there’s another American,” then upon looking closer realize I was wrong. I’ve grown used to being around all black people. *Everyone spoke Spanish which I didn’t understand. This was disorienting. I had a hard time remembering even basic greetings in Spanish, and kept reaching for Creole every time I wanted to speak with a local. *No money or SIM card. I’m used to always having both. But Bolívar’s are difficult to get changed from US (and a rip-off, as mentioned above), and I never bought a SIM ‘cus I never saw a one. And I forgot about buying a SIM at the airport when I arrived (for an obvious reason). I’m clean-cut now… feels weird, but this Caracas-buzz is more practical for the heat of the tropics and limited-water bucket showers. Venezuelan food reminded me how much better many other ethnic foods are than Haitian food. The tastiest part of my Haitian “rice and beans” is often the non-Haitian Louisiana Hot Sauce I put on it. A common enough dish in Venezuelais the Arepa. It tastes just like it looks: a flatbread taco with meat and salty-cheese inside. Delicious. Cheese is big in Venezuela. The cheese was saltier than I’m used to, but I liked it. Street burgers were my next-favorite food besides the arepas. The one I had was loaded with tons of stuff, including crunched up potato chips. Cheese empanadas were common for breakfast. They’re like caramel empanadas at Taco Bell, but with cheese instead of caramel. I found them greasy. This was my fifth time flying into Haiti. Times #1, #2, and #3 I dreaded each time. Maybe not #1 because I didn’t know what I was getting myself into yet. But for sure times #2 & #3 felt like flying into a war zone and I was cringing in dread each time. My 4th time to come in was six months ago. I was nervous then because I was entering a new job and had to meet new people I didn’t know. How would it work out? It worked out fine, and during these last several months I’ve come to feel comfortable here. I now know my way around. I can even talk to people in Creole. I know what to expect. I feel safe. I know how to buy food and where restaurants are. I have friends. I have goals and things I’m working towards. I have wheels so am mobile. I’m a legal resident. In fact, it feels too easy, and I’m almost to a point of longing for a new challenge. But living out at this village should keep me occupied awhile. On the last leg back (from St. Martin to Port-au Prince) I could feel myself becoming more culturally comfortable. Nearly everyone on the flight was Haitian. I started understanding (to some extent) what people were saying around me. Strangers began talking to each other, which is a very Haitian thing to do. A loud conversation begain amongst people behind me, across from me, several rows in front of me, and about five rows behind. What started good-naturedly ended in two random guys arguing from aisles away so loudly I thought it might come to blows – a steward had to tell them to quit. I know I don’t want to live here forever, but to be honest, I feel like this place is larger than life… an extreme location. In the last six months I’ve daily witnessed crazy things. Even yesterday, within minutes of landing at the airport I was having a crazy experience: The parking lot exit was blocked off so Ryan began reversing through the entire congested lot, squeezing backwards through impossibly tight spaces, sparring with others cars, and eventually exiting back through the entrance. It was an impressive driving feat. My Latin American adventure was a great time and something I’ll always remember. It was a first for me going on a trip to another country where the return flight “home” wasn’t to America. While publicly the Venezuelan’s seemed reserved, each Venezuelan I met through friends seemed over-the-top kind and fun. If I lived there and learned Spanish, I know I would grow to love the place (as we know, love takes time to grow). I couldn’t have asked for a more thoughtful host than Natalie. She went above and beyond to make my time comfortable, enjoyable, and worthwhile. So that’s the update for now!